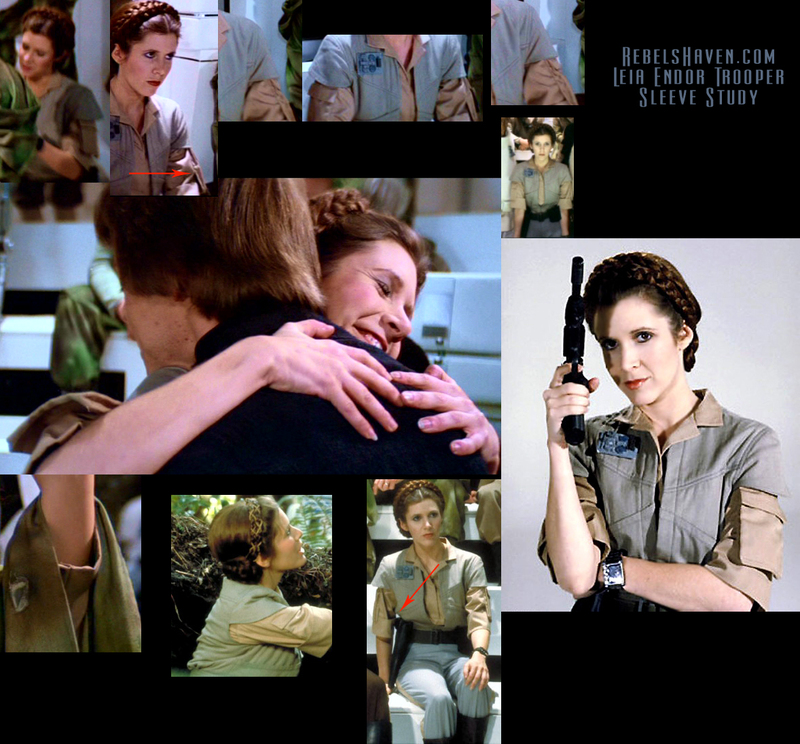 This page is just for the pockets seen on Princess Leia's shirt in Return of the Jedi. The pocket itself is very simple, but the construction with the expansion band may be a bit difficult. I have taken the liberty of creating a printable pattern for the pocket as it should work proportion-wise for any size shirt. It should print to size, but I've included a 1" scale in case it gets skewed by printing or xeroxing. As you can see in the pattern, you will have a pocket front and interfacing, a pocket back and interfacing for the outside flap, and a 16" strip, cut per instructions on page 1. You will start by fusing interfacing to the back of your front pocket. Fold back the half-inch grayed section at the top and press. Next, take your 16" strip (which is longer than you need) and fold back a half inch and press. You will pin the strip starting on the top right, matching up the folded edges and pin down the side. Mark 1/4" from the bottom of the pocket and insert a pin. Stitch 1/4" seam allowance to this point you marked. With your needle in the fabric, lift the presser foot and turn the pocket to stitch the bottom. Pull the strip to line up along the bottom. This will take a bit of fiddling to make sure there is no pucker when you are done. As with the side, you will stitch until you are 1/4" from the bottom. I prefered to make a mark beforehand. Stop and swivel. 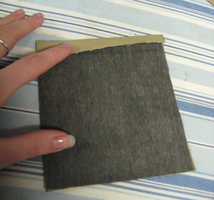 At this point, you can measure 1/2" from the end and snip the excess strip, and fold down until the folded ends match. Stitch to the end and finish. Fold back the strip and press. The front of the pocket is done. Finishing the strip, and finished pocket front before turning. Now comes the back. Mark your fold lines, and fuse interfacing to the back of the Outside of Flap as indicated on the pattern and flip over to the right side. 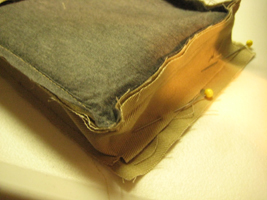 First you will fold down along the pocket flap bottom line so that the interfacing on the back is showing; your pocket flap is inside-out now. Mark 1/2" up from bottom (to the topmost fold line). Stitch on the sides of the flap to the 1/2" mark. Pocket Flap folded backwards, and turned pocket flap pressed down. Clip your corners and turn the pocket flap back right-side out and press. You may want to clip the side of the seam allowance at the bottom of the stitch so that part stays folded in. With your pocket flap back, your topmost fold line and the one at the bottom of the flap should match up. Topstitch here, it's on the inside of the pocket and won't be noticed. It also keeps everything flat. You can nowfold the pocket flap down along the topmost fold line. That extra 1/2" at the top should be under the flap on the back of the pocket. There is an extra 1/4" between the flap and the pocket so it folds properly. Now you will be attaching your pocket front and back. This part can be tricky. You will want to take the pocket front and lay it face up. Take your pocket back and lay it face up on top of the pocket front. The outside pocket fabric should be facing the back side of the pocket back. 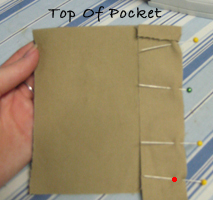 Pin the strip to the side of the pocket back like you did when you assembled the pocket front. It will start 1/4" from the fold of the flap, where the line is on the pattern. 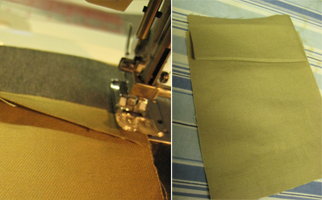 You will stitch 1/4" seam allowance down to 1/4" from the bottom of the pocket. Here, you will do something different. Backstitch and end your stitch. Turn the pocket around and stitch the other side. Now, you can pin down the pocket bottom. Doing it this way helps make sure there is no excess in the pocket bottom. Once finished, turn the pocket right-side out. It might help to clip corners, and clip the seam allowance of the strip where you pivoted, you will notice it curls up at those points. The final step is to make the pocket fold in the way Leia's does. Along the side of the pocket extension strip, push this in towards the pocket interior so the pocket front and pocket back are laying flat on top of each other. The pocket bottom should be poking outward instead of folding inward. 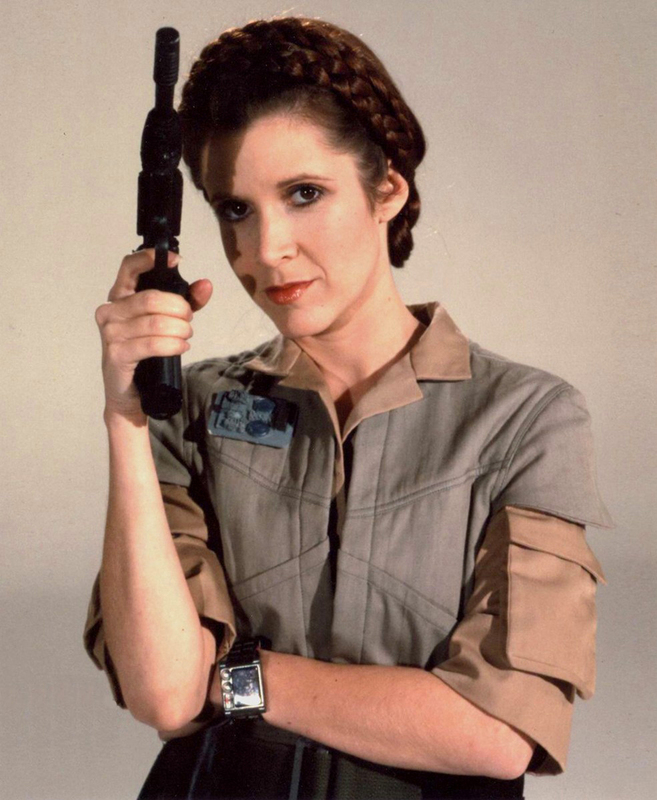 The pocket corners should tuck in naturally to look like Leia's. Give the pocket a good pressing. Finally, at the top where the pocket opens, add a tacking stitch to each side, which will keep the pocket laying how it should. Now you can return to the shirt assembly instructions!